The Two of Pentacles tarot card teaches that balancing pleasure and responsibility are the keys to a successful life in this world. True, sometimes it feels more like a juggling act, but the more you practice, the better you become. In the end, you discover that juggling is actually a lot of fun, and you can even do it while dancing a jig! Your sense of accomplishment does wonders to your self-esteem. In fact, despite life’s ups and downs, you still manage to come out on top. 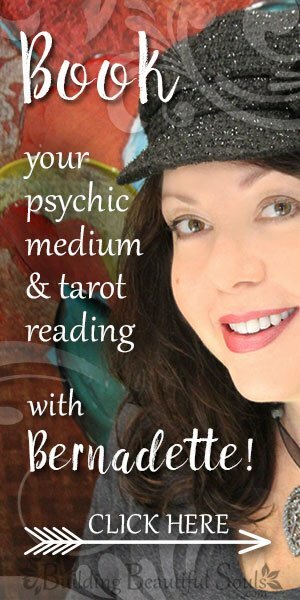 What makes The Two of Pentacles tarot card so fascinating is that it shows you how it’s done. Look at the Two of Pentacles closely. The scene in this image is a stage performance, meant to entertain as well teach. And who says learning isn’t supposed to be fun? When you learn with your heart as well as your mind, you can make the most out of every lesson life throws your way. The dancer on the Two of Pentacles card performs his act on a grey stage, representing fundamental and quite serious principles. The blue backdrop shows that the real learning occurs at the subconscious level. Ships with colorful sails bounce around on exaggerated ocean waves across the background of the Two of Pentacles. In The Two of Pentacles tarot card, the waves represent the ups and downs we experience as we go through life. They also remind us that that there are many things we cannot control. The ships in the Two of Pentacles symbolize our resilience, the ability to stay afloat, no matter what happens to us. Ships also symbolize travel, messages, and profits. 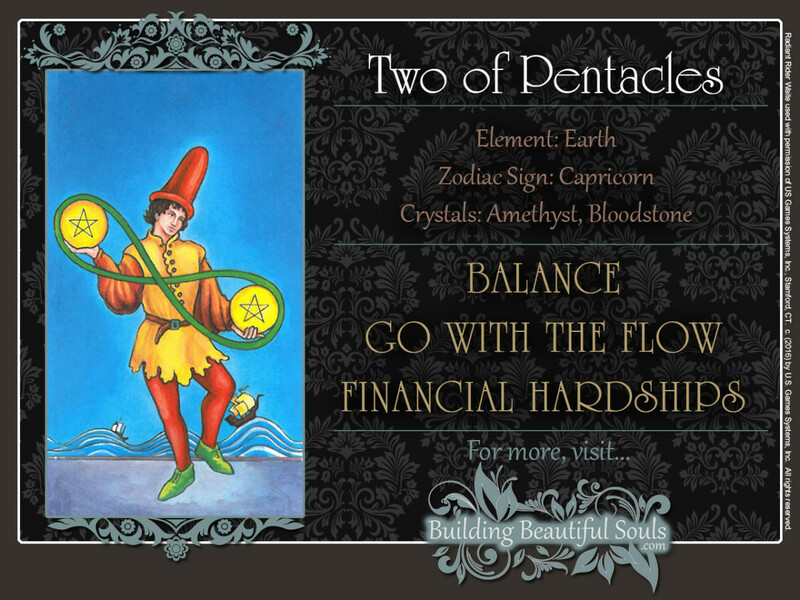 In the Two of Pentacles tarot card, the dancer himself is dressed in green, red, and orange. These colors symbolize life, passion, and wealth. Therefore, this performance teaches us about the joy of living in the physical world. Notice the green ribbon in the in the shape of the infinity sign around the pentacles, simulating the never ending act of balancing – or juggling – pleasure and responsibility. If the Two of Pentacles shows up in your tarot reading upright, your life certainly is a whirlwind of activity right now, but it looks like you’re having fun. Others are marveling at how you manage to get it all done. They are amazed that you can weather the worst storms and still come out smelling like roses. You, in turn, chuckle when they say you’re some kind of miracle worker. You don’t consider yourself one, but you know you have figured out something they haven’t. The secret to your success is so simple, you wonder why others haven’t discovered it long ago. Here it is: Every life experience, no matter how small, presents an important lesson. The more you are aware of your surroundings and actions, the more you learn, and with learning comes wisdom and skill. You know that people learn by watching, doing, and feeling. You also know that joy is a better teacher than pain. Your approach to learning is systematic, but intuitive. Reading a textbook bores you to death, but if someone shows you how to do a task, you have no problem practicing it until you get a feel for it. If you were an auto mechanic, you could tell what’s wrong with a car engine simply by listening to the engine. The Two of Pentacles is not a card of passivity. It embodies the principle of balance through constant motion and intuitive awareness. You can learn the principles of juggling from a book, but as long as you’re consciously counting how many balls you have in the air, you’ll keep dropping them. However, once you’ve internalized the rhythm of releasing and catching there is almost no limit to how many objects you can juggle. Balance is a feeling, and its accompanying emotion is joy. You have learned that this principle applies not only to specific skills, but to all areas of life. Knowing that responsibility and pleasure are both necessary to leading a satisfying life, you intuitively give each their due attention, never completely neglecting one for the sake of the other. When The Two of Pentacles card presents itself inverted in a tarot reading, things are, well, less than perfect. Oh, you’ve got your game face on but you’re discovering that there is only so much you can do at a time is a painful but important lesson. Ride this storm out with as much dignity as you can muster, prioritize your tasks, delegate wherever possible, and ask for help when necessary. This is no time for false pride. No, crying about your problems on some day time TV talk show is not your style. That’s wise, and that’s one of the things people love and respect you for. But they can see the sweat beading on your forehead as you still try to flash that million dollar smile. Work hard and play hard is a motto that has built many great nations, but there is such a thing as too hard. You are rapidly discovering that everything has its limits. Are you working yourself too hard, or are you loosing yourself in pleasure-seeking? Constantly living on the edge will burn you out quickly, and you need to slow things down. Are you too proud to ask for help? The time has come to lose that pride, and if you do, the situation is far from hopeless. You are not alone, and others are ready to help you with word and deed. This first step in regaining control is accepting that yes, you could use some help, be it from friends or the divine source. Use your remarkable powers of perception to realize that the waters are indeed troubled, and have enough faith to muster the strength to ride this storm out. Know what you need, so that others can provide you with important resources. Set priorities for yourself, so that you can focus your energies and resources on the essentials, maximizing your successes and minimizing your losses. Here, the Number 2 represents balance and action in the material world. On the Tree of Life, 2 is associated with the sphere of the Western Zodiac, thus symbolizing the interaction between the individual and the cosmos. In short, our individual actions can impact others in ways we cannot often predict.